Formula 1 broadcasting in the United Kingdom in recent years has enjoyed a rich offering, with both the BBC and Sky Sports throwing hours of air-time at the sport. For a live weekend, the BBC would dedicate ten and a half hours of air-time, with Sky Sports adding a further thirteen hours (excluding GP2 and GP3). But things have not always been that way, and a lot has happened to get to where we are now. 1995 was the first season that the BBC showed every race live, with qualifying being covered in a post-session update during BBC’s Saturday Grandstand on BBC One. It was only when BBC lost the coverage in December 1995 did they up the ante, to lay down the marker as it were, for ITV. The following year, the BBC showed 15 out of the 16 qualifying sessions live (Japan the exception) as well as sending Steve Rider out on location for the majority of the European races, setting down a marker for ITV. The average programme length for the race was 2 hours and 20 minutes, but there was limited post-race analysis, the BBC choosing to move to the next sport in the afternoon immediately after the press conference. ITV’s coverage in 1997 resembled something closer to what we recognise now, with a proper presence at the circuit in the form of an on-site studio and an expansive pre and post-race session analysis. The studio element was dropped for the start of 2004, with ITV now allowed to broadcast live from the paddock. Over the course of their coverage, ITV’s pre-race build-up expanded from 30 minutes to an hour in length, with a greater quality of features being produced by North One Television (previously known as Chrysalis). However, ITV never fully exploited the post-race analysis block, too often quickly getting off air without exploring the race that happened before it, this was a common problem with the American-zone races. In 2008, ITV added Friday practice to their online portfolio, which the BBC followed up on in 2009 by airing all three practice sessions behind the Red Button as well as online. BBC learnt from previous mistakes, creating an interactive Red Button forum, which aired for an hour after their main BBC One race day coverage. The forum became a fixture of BBC’s offering and was well received from the get-go. Although the forum dipped in quality in BBC’s later years, it still showed a commitment to the sport that was not there beforehand. Channel 4 on Friday mornings typically airs repeats such as The Simpsons, Everybody Loves Raymond and Frasier. Aside from the News Summary at 12:00, there is no new programming on the network until Deal or No Deal at 14:10. Although the slate of programming does deliver solid numbers for the network, I think Channel 4 would want to showcase Formula 1 as much as possible. Given that Channel 4 have been happy to displace the likes of Deal or No Deal and Countdown for horse racing coverage over the years, I don’t think there will be any issues in displacing repeats for Formula 1 practice. If live practice clashes with horse racing, I would expect the latter to be given priority, however it is the latter’s last year on Channel 4 so they may want to give F1 priority, with horse racing being bumped to More4. The more interesting question for me is whether we will see any colour wrapped around practice. Sky Sports since the beginning of their coverage have added a short introduction and post-session analysis with a presenter and pundit talking for five to ten minutes, the BBC have followed on in recent years. Is there any value to be added by adding colour to practice coverage? Not really. I would be happy if Channel 4 went for the ‘World Feed only’ approach to Friday practice. There may be one time out of ten where there was a key incident which could do with extra analysis, but not enough to justify anything more. Channel 4 need to use their resources wisely. Saturday practice should be the session with all the ‘bells and whistles’ around it, the timeslot two hours before qualifying begins means that it brings in a higher audience than the previous day’s action. Instead of pouring resource into practice, the resource should be allocated towards a magazine show, to attract the casual fan. If we look at The F1 Show on Sky Sports outside of race weekends, it originally started a chat show discussing the latest stories, with no audience in attendance. To some degree it still is, except there is now a studio audience. The problem is that the show has failed over the past four years to get any high-quality guests in – presumably Lewis Hamilton and Jenson Button are above the budget that the show has. The F1 Show may attract some hard-core aficionados, but it does little to attract anyone beyond that. Of course, The F1 Show has not been the only magazine show. In the late 1990s, ITV aired Murray and Martin’s F1 Special on Saturday evenings (although that was filmed on location). At 20 to 25 minutes in length, the show reviewed qualifying and aired some features to attract a non-F1 audience. Is it possible to design an F1 magazine show to attract a casual fan with a passing interest in the sport? I’d like to think it is, whether it is on Channel 4 or their sister channel E4. This part is dependent on whether Whisper Films win the production contract, but someone such as Jake Humphrey would be the perfect person to front a magazine show. Guests such as Hamilton and Button, alongside celebrity Formula 1 fans would make it a worthwhile watch. The problem we have had with The F1 Show is the same opinions week in, week out, it looks and feels like a ‘paint by numbers’ show. On a Friday evening, I do not want to watch what feels like a ‘heavy’ magazine show in The F1 Show. Any new magazine shows that air outside of the race weekend does not need to be live. If Channel 4 can get better quality guests in a recorded show, so be it. Sky have constrained themselves with the live studio shows, in my opinion. Recording the show also gives you flexibility with scheduling. This season, Channel 4 will be screening 22 highlights shows where they do not have the rights to screen live coverage. As a general rule, BBC’s qualifying highlights show have been 75 minutes in length, which would equate to 57 minutes excluding adverts. BBC’s race highlights have been 90 minutes in length, which equates to around 66 minutes excluding adverts. For the moment, let’s say both of those stay the same for 2016, with around 12 minutes of build-up and 12 minutes of reaction. That means viewers would see around 33 minutes of qualifying action and 42 minutes of race action. If you want an extensive highlights programme that is to match the quality of its predecessor, I think you would struggle to justify not extending the lengths of both shows on Channel 4. Is Formula 1 being presented from a studio automatically a bad thing? Here, Steve Rider and Mark Blundell present ITV’s coverage of the 2006 Japanese Grand Prix from the London studios. I expect the qualifying highlights show on Channel 4 to be 90 minutes and the race highlights show to be two hours long. That gives you approximately nine minutes extra of qualifying action and around twenty minutes more of race action. It also gives Channel 4 a longer window to build an audience during the transmission slot and to time their ad-breaks strategically. I don’t anticipate the style of the highlights programmes to change significantly. One option is to keep some of the presentation team in London to keep costs down, especially for the fly-away races. I would not be opposed to this, as long as there is a benefit to it. If it brought something new to the coverage, such as getting a few new faces and opinions involved, or using the latest gadgets, I would be all for it. Would it be considered a reduction in coverage? I think it would be only considered a reduction if they presented live races fully from the studio, like ITV did on numerous occasions with the Malaysian and Japanese Grands Prix. The timeslots I imagine will be similar to the BBC’s slots. Highlights for the fly-away races will probably air at 12:00 as there s no Channel 4 News lunchtime summary at weekends, the European races at 17:00 with the American races at 22:00. It would be interesting to know what the contract stipulates with regards the latter, Channel 4 may wish to air those shows earlier as the audience at 22:00 drops off significantly. If BBC One’s highlights around that time averaged just over two million viewers, you fear that Channel 4 may struggle to hit 1.5 million with a much lower lead-in before it compared to the BBC but time will tell. As referenced above, the BBC were typically live for 125 minutes for qualifying and live for just shy of four hours for the race when you include the Red Button forum. Unquestionably, both qualifying and the race will be live on Channel 4, irrespective of any clashes. Moving a race to E4 or More4 would not go down well with either the fans or Bernie Ecclestone. And given the amount of money Channel 4 have paid for the rights to broadcast Formula 1, it is probably not in their interests. Before we talk about the content, again the subject of adverts should be touched upon. We already know that the actual race itself is ad-free. What we do not know is how late before a race Channel 4 can insert an ad-break or how soon after a race. I would assume the two answers are “before the 5-minute sting” and “on the slowing down lap”. That would be a similar arrangement to BT Sport’s MotoGP coverage, BT opt to go to a break virtually as soon as the race is over. The risk you run is that you lose your audience instantly which, in Channel 4’s case will equate to many thousands. A better strategy would be to place the first ad-break after the podium ceremony to keep the audience for longer, but at the same time Channel 4 will want the first ad-break post-race to be as profitable as possible. A difference of five minutes after the race can mean the difference of a million viewers watching the ad-break. Like with the highlights programming, commercial breaks have to be placed sensibly so not to annoy the audience. Watching Sky’s current coverage, you can specifically tell when they are about to take a break. What frustrates me is that the channel feels the need to tell audiences constantly what is “coming up”, which is problematical when the channel should be using the available airtime wisely. I felt in 2015 that Sky chose to hype up features far too much by wrapping VT’s around ad-breaks for little reason whatsoever. The audience should be naturally building towards the race as it is without the need to hype the next item. I can’t see Channel 4 providing a 90-minute build-up, but there is scope and opportunity to entice the current Sunday Brunch audience by linking to the paddock once or twice through the course of the programme to get an update on the action and grab a live interview with a key F1 star in the hours before the race. That is a good way of providing the best of both worlds, in my opinion. In terms of the Formula 1 build-up, I would expect to largely be on-location with a similar style to BBC and Sky, although again studio coverage should be considered if it enhances the quality of the programme. If you wanted to sustain the Sunday Brunch audience preceding it (for European races), you could do a seamless transition with ad-breaks taken at 11:50 to 12:10 respectively, and opening titles at midday so that the audience does not jump ship. The Inside Line is a magazine show referenced earlier in the piece if Channel 4 wanted to do something similar to their historical cricket and horse racing coverage. In theory, The Inside Line and live updates during Sunday Brunch can be done irrespective of whether Channel 4 are broadcasting that race live. You only irritate the Sunday Brunch audience if you overdo the Formula 1 links. But two x five-minute links within a 150-minute programme is not excessive, in my opinion. 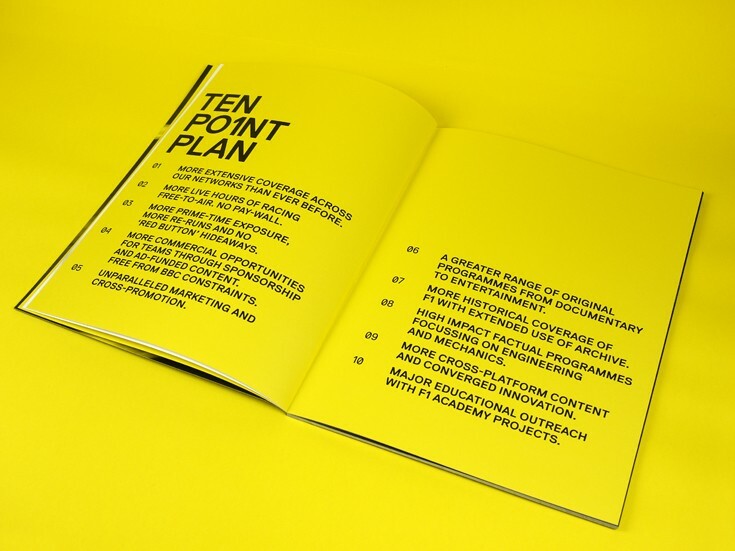 The ten-point plan that Channel 4 proposed in Summer 2011 to try and capture exclusive UK F1 rights. Following the race, I would expect Channel 4 to stay on air until around 16:15, so that they can re-coup on ad-breaks, a split programme like the above schedule is therefore likely. An idea would be for Channel 4’s post-race action to “slip behind live”. In other words, when we see four minutes of adverts, the team on-location only stop for around 30 seconds. So, whilst the Channel 4 programme finishes at 16:15, they have finished filming at 15:55 UK time. The Inside Line for your post-race segment could be studio content mixed with on-site content. If you can good quality guests in the studio that are unwilling to be on-site, I would again be all for it. Furthermore, you could use said guests earlier in the coverage, such as giving opinions throughout the race itself. One thing Channel 4 may want to do is air highlights shortly after the live race at around 17:30. In my opinion, doing so would be playing is a dangerous game, simply because the audience could start drifting towards the highlights package rather than the live race itself. Highlights for the live races should be played out on More4 in the evening, and then again in a late night slot on Channel 4. The same applies to repeats of practice and qualifying. Quoting directly from Channel 4’s ten-point plan in 2011, the extra on-board cameras and Pit Lane feed would no longer be Red Button hideaways. Instead, the feeds would be ‘road blocked’ across Channel 4’s portfolio of channels: E4, More4 and 4seven as well as online. I can imagine it now: “If you want to watch the race from the view of Lewis Hamilton, head to E4, and if you want to watch the race from Sebastian Vettel’s car, jump to More4 for the duration of the race.” You could even make the process interactive by getting viewers to vote for the content that they want to see on the three other Channel 4 channels. That sounds a lot better than telling viewers to go through to the Red Button whereas all you need to press is three buttons. Lastly, remember that if you miss any of Channel 4’s coverage, there is always the +1 options which (it is assumed) will be available for all of their Formula 1 coverage. I’ve over-egged and under-egged some points above, and probably missed a few bits out, but the above is just some thoughts on how I would like Formula 1 to be scheduled on Channel 4’s portfolio of networks. Definitely the Horses will be on More4 when there is a clash with F1 on a Friday unless there is a really big race on (but isn’t that usually on a Saturday). I would suspect that Bernie would’ve made sure during negotiations that F1 is on the main channel and that would be logical for C4 because it is a longer term investment than the horse racing which goes at the end of the year. I am really looking forward to Channel 4’s interpretation of Formula One. Hopefully they can produce something that can showcase F1 to the younger generation. As a Sky watcher I do hope Channel 4 can push Sky’s quality up as a broadcaster that really seems to care compared to the BBC attitude of last year in particular when management wanted to get rid of it. I agree re not hyping what’s coming up after the break (sometimes you can see the majority of the feature just by doing that as Sky clearly cut so much of the feature and show far less than they record). The above schedule is a good idea, I like the idea of the rap around coverage, however, cannot see Channel 4 doing this. Obviously, to provide extensive build up Sunday Brunch will have to be shortened. Also, I think Channel 4 will have a small build up and outro to Practice, but in a similar vein to BBC. For highlights race weekends, it is more simple. Here are my thoughts on what Channel 4 will put in for coverage. I think that covers the majority of the areas. For the live Morning FP3 session, its supposed to say 2:40-4:10. pressed the wrong key. I think all highlights shows will be 2 hours; even 2 hours 15 minutes because they will probably show the whole race but with ad-breaks throughout. Follow a similar showing as ITV’s MotoGP. So, the viewer won’t notice major cut-aways. The format would be a 10 minute build up, followed by the race and then 10/15 minutes of analysis and interviews. Good spot, will adjust, thanks. This is how I picture the schedule taking place, with the addition of an F1 Flashback (classic) programme if the rights are awarded. For a live weekend in Europe I would think all live track sessions will be shown on Channel 4. This will occur even when there is live Horse Racing as F1 should be a higher priority as they are losing the horse racng. On a Thursday night each race I would put on a one hour pre-recorded magazine show from the circuit. You notice that the F1 Show on Sky is far better quality on a race weekend. This would serve as a recap of the last race, a preview of the upcoming weekend with interviews with key people after Channel 4 News at 20:00 to hopefully pick up and interest casual news viewers who don’t know much about F1. Introductory Formula One knowledge could be imparted to the casual viewer in this programme with the ambition they would join coverage for the rest of the weekend. As for Friday morning the usual programming on Channel 4 from 08:30 to 11:00 is Everybody Loves Raymond, Frasier and Undercover Boss repeats. This can be easily replaced by F1 Free Practice and probably with a big boost in numbers in the process. I’m also sure advertisers would be keener on F1 Practice than an episode that people have seen five million times. The obscure thing is that an episode of Everybody Loves Raymond goes from 08:00 to 08:30 and another until 09:00. Do Channel 4 start F1 from 08:30 or do they run through the Everybody Loves Raymond and start at 08:55 with less ads? I think they will start at 08:30 and pack that half an hour before the session with adverts (as much as Ofcom will allow) before a start at 09:00 on Channel 4. The session ends at 10:30 and Channel 4 will recap and go off air at 11:00 after packing that half hour full of adverts. In regard to Free Practice 2 at 13:00, Channel 4 has the News from 12:00 to 12:05 and Come Dine With Me until 12:45 (they did on Fri Dec. 11 which is the latest schedule I can find). This would fit perfectly with F1 starting at 12:45 and running until 15:00 where they could join an episode of Countdown at that time. If there is Horse Racing on that day it would probably move to More4 as from 2017 they won’t have rights meaning an investment should be made with the Formula One. Replays of Practices 1 & 2 should be put on More4 in the evening at 19:00 to catch the people who were out during the day. Saturday mornings are full of more repeats of Frasier and the Big Bang Theory so are non-issue for Channel 4 to put Free Practice 3 on the main channel starting from 09:45 after a shortened The Morning Line until 11:15 when they would show other programming. For Qualifying they would start at 12:00 with a qualifying show before the session at 13:00 to end at 14:00 and to wrap up coverage at 14:30 to switch to Saturdays Horse Racing which started on More4. A qualifying replay show would be shown at 19:00 on More4 for two hours. Sunday’s version of a 2 and a half hour Sunday Brunch would have various references to the upcoming Formula One Race coverage with one short link to the circuit and promos throughout the show. Some F1 Practice Highlights and a Qualifying Replay would be shown on More4 from 08:00 until 12:00 (Practices 1-3 from 8 to 10 and Qualifying from 10 until 12). The race coverage starts at 12:00 before a race start at 13:00 which will finish at 15:00 on Channel 4 and the race show at either 15:30 or 16:00 depending on race length. Most shows will finish at 16:00 with only Monza at 15:30 since that is a very short race. A race repeat will be shown More4 at 20:00 with adverts included in the race. This will probably end at 22:30 with some pre and post race coverage added, depending on race length. In my eyes, Channel 4 should attempt to go to all race weekends, however if that is not possible, they could present the highlight shows for the flyaway races from the studio. i hope that channel 4 decide to have the additional feeds (in-car cameras etc..) on there website or something for all sessions as i would miss having access to those during the live race weekens, was something i always used alongside the bbc coverage. I do think it’s unlikely that Channel 4 will ‘strip’ the additional feeds across their channels. I just don’t think that this will gain them an advantage (as the F1 audience will be split between the channels, and non-F1 fans will not be tuning in at all, unlike if E4 was showing a sitcom, for example). I always thought that the ‘Red Button hideaways’ line in the 2011 document referred to FP sessions, rather than the additional feeds. I can see C4 putting the additional feeds online and via the All4 app, but I would be very surprised should the feeds go across their digital channels. It would be great to see a magazine show, too. A word of warning, though, and I say this as a die-hard C4 cricket fan. C4’s history is to be very keen on a sport in its early years and give it acres and acres of coverage before losing interest and gradually stripping back. You saw it with the Cricket Show. That programme was a shadow of its predecessor, the Cricket Roadshow, which ran from 1999-2002 – it was a live, vibrant hour-long programme that came from different cricket grounds each week and made C4 feel like the heart of English cricket. Whether they were showing a live match or not, you could tune in between 10am and 11am for a lively fix of English cricket. In 2003, the decision was made to reinvent the programme as the Cricket Show – it was now pre-recorded, just half-an-hour in length and dotted about all over the schedules – 8am on Saturday mornings, in its final season it was at 8am on Sunday mornings – and only when C4 had a live match did it have its former scheduling slot (and even that was shortened to half-an-hour). I’m fascinated to see what C4 do with F1, and am hoping that it will go very well! The format of Top Gear and some of the BBC F1 features should be the aim for an F1 magazine show. Make it prime time on a Thursday or Friday night. Film some ‘Top Gear Specials’ well in advance, and mix them in with other features recorded during the run up to race weekend. Essentially the focus would be on the personalities of the drivers, i.e. go straight to ‘fun’ a la Top Gear and cut back on the Julian Wilson-ness of facts. Apply to the world of F1. Whisper might not be badly positioned to produce this. Pitch the format to Bernie and get some money from him. Sell around the world a la, err… Top Gear… result = people (young and old fartish) enthused about F1 and having sime fun with it, and less dull f***** F1 politics. Here’s hoping for some innovation with this C4 move. ITV had a “Speed Sunday” programme in (I think?) 2004. It was quickly dropped because of a lack of ratings. There was talk of Sky dropping the ‘non F1 weekends’ F1 Show to cut costs this year. Is that still the case? I think that the schedule will have as much build up as possible to provide adverts every 10-15 minutes. This includes all 3 Practice sessions. I think that Channel 4 will get rights to Classic F1 racing from FOM, as Sky did but can’t see them getting any BBC archive material from the BBC. As for Highlights races I think the schedule will look like a shortebed version of the live race weekend. I have added a Forum style programme to the highlights schedule because it was arguably the best part of BBC’s Bahrain 2012 schedule after the Highlight programme. I think it could give use to the Technical Analyst on a Highlights weekend because it will mean less race coverage will be shown if this section is included in the main show. Hope people would agree with that idea.